For most of my adult life into my early forties, I worked full-time for one corporation or another. Being a wife and mom at the same time left me very little time for myself and my hobbies. I doubt I completed one art project during a whole year on average. Snapshot of original oil painting. The painting also holds a place in my heart because my kid, who was probably around ten or so at the time, had taken a special liking to it and wanted to hang the painting in their room. 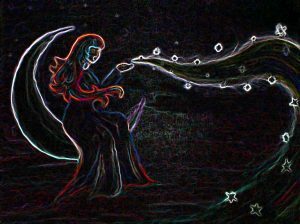 This probably wouldn’t seem quite so special to someone who was producing art regularly, but for me it seemed magical. As I experimented more with digital art , I started playing with visual effects on this piece. I actually have a few variations now that I like to use at times. Ultimately, I consider this next one my “final” version. (For now, anyway.) It’s a watercolor-style digital rendering of the original oil painting. 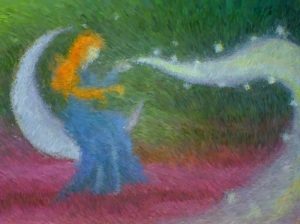 Now that I have better photo equipment, maybe I’ll try to get better pics of the painting that can be used for quality reproductions or prints. Or maybe this will forever be one for the archives. Who knows? 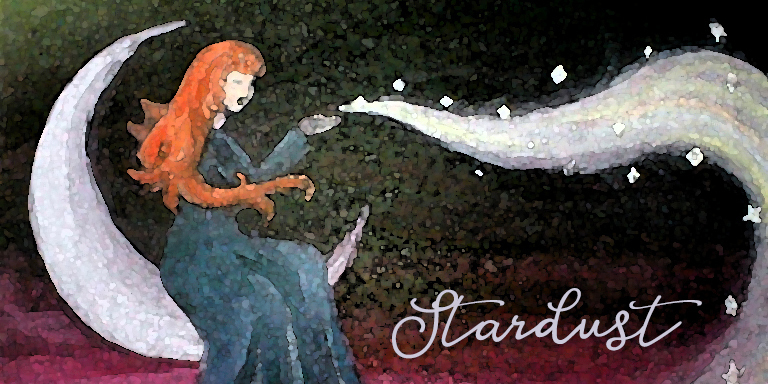 Featured Art: Stardust. Oil on canvas, digital renderings.